KHENPO KARTHAR RINPOCHE was born in Rabshi, east Tibet, in the province of Kham. He was born in the second Tibetan month of 1924, the fourth child to a modest but self-sufficient nomad family. 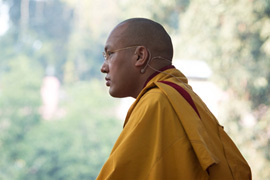 His parents practiced Buddhism diligently, and his father taught Rinpoche the Tibetan alphabet and various scriptures. Thus, he learned to read and write, and began to memorize texts. When he was twelve, Rinpoche entered Thrangu Monastery, where he found that his training in written Tibetan and the scriptures prepared him well for the rituals and prayers that were now a part of his daily monastic life. For six years, he studied and practiced in the monastery. 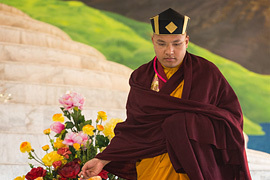 At eighteen, he and a few other monks were sent on a pilgrimage to Tsurphu Monastery, the seat of His Holiness Karmapa, to meet him for the first time. 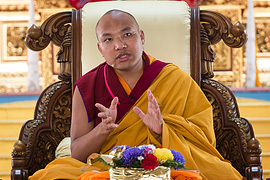 Under ordinary circumstances, the monks could have received their gelong ordination (senior monk's vows) from the Karmapa, but at that time His Holiness was not yet twenty years old, too young according to ordination tradition to give the vows. When Rinpoche was twenty, he traveled to Palpung Monastery, the seat of the Tai Situ incarnations, where he received his gelong vows from the Eleventh Situ Rinpoche. 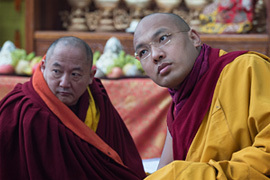 Consequently, Rinpoche's root guru for the vows is the previous Situ Rinpoche, and he considers his root guru for the teachings and philosophy of Tibetan Buddhism to be Khenpo Lodro Rabsel. 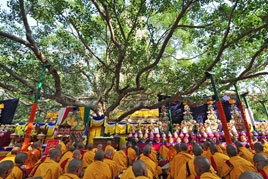 After his gelong ordination, Rinpoche returned to Thrangu Monastery for the rainy season retreat, a yearly tradition that began when Shakyamuni Buddha secluded himself during the rainy season in order to avoid accidentally killing the many insects and larvae that are most prolific during this wet period. 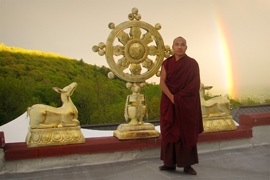 After the three-month retreat, Rinpoche undertook a one-year solitary retreat. 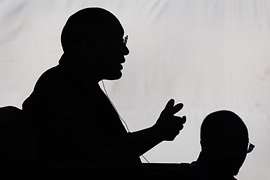 Soon after, he entered the traditional three-year, three-month, and three-day retreat along with nine other retreatants, a retreat master, and a retreat attendant who provided food, supplies, and other necessities. These eleven were the only people Rinpoche saw during his three years of seclusion and intensive meditation at Thrangu Monastery. When the retreat ended, Rinpoche's heartfelt wish was to remain in retreat for the rest of his life. However, on the advice of his teachers, he entered a one-year retreat in his uncle's cabin. At the end of the year, Rinpoche was advised by Traleg Rinpoche, the abbot of Thrangu Monastery, to study more advanced teachings on Buddhist philosophy, psychology, logic, and metaphysics since he felt Khenpo Karthar Rinpoche had gained insight through his years in retreat. Rinpoche entered a new school at Thrangu Monastery which emphasized these subjects and was founded to educate Thrangu Rinpoche, who was then in his teens, and other monks. 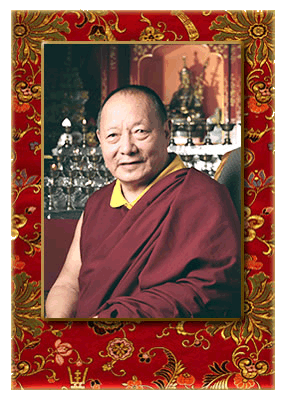 Five years later, when Rinpoche was thirty years old, his advanced training was completed. For the next several years he and Thrangu Rinpoche traveled together and gained teaching experience while pursuing their private studies and sharing long discussions on the dharma. Between 1950 and 1958, the presence of the Communist Chinese in Tibet brought political, economic, and religious changes to the Tibetan people, along with vast suffering and rampant destruction of their way of life. 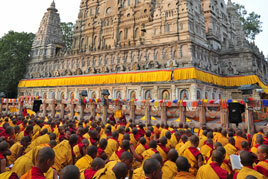 In 1958, Rinpoche left the monastery with Thrangu Rinpoche, Traleg Rinpoche, Zuru Tulku, and other monks. Though many sacred objects and volumes of dharma texts were destroyed, Rinpoche was able to save some. With small provisions of food and clothing, and a few horses, Rinpoche and his party began their long trek westward, and were soon joined by a caravan of nomads with their flock of sheep. After fifteen days of travel, the Rinpoches stopped to rest, only to find themselves surrounded by Communist Chinese soldiers. Since night was falling, the Tibetan refugees were able to escape via a nearby swamp, and readied three horses to carry Thrangu Rinpoche, Traleg Rinpoche, and Zuru Tulku. Zuru Tulku, who was the eldest, could not have survived on horseback, so Khenpo Karthar Rinpoche's younger brother carried him. Everyone headed in separate directions across the swamp, which was very flat but punctuated with small gorges and areas where one could easily and quickly hide. 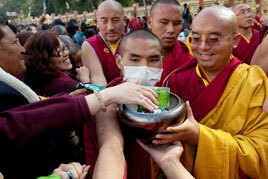 On the second day, Rinpoche found a few of the monks and was relieved to know they were alive and unhurt. 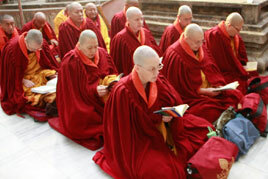 Gradually, the remaining monks were found and on the seventh day of their escape from the soldiers, they were joined by the Rinpoches. The party survived those seven days without food since the mule carrying the provisions had disappeared. They ate snow to prevent dehydration, and were forced to return to the place where the soldiers had surrounded them to look for food. The Communist Chinese were gone, and almost nothing was left but a few utensils and a little flour. Carrying the meager ration of flour, the lamas continued their journey. Their vision was blurring and they were so weak they had to avoid even the smallest incline by walking around it. After another week of travel, the Rinpoches found a horse carrying tsampa, a staple of roasted barley flour. They mixed this with water and although the mixture was very thin, a ten-course dinner could not have been more appreciated. 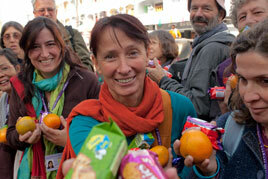 A few days later, the lamas met some nomads who gave them more provisions. 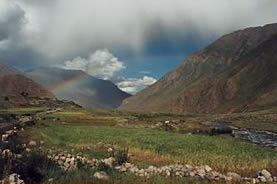 Two and a half months later and without further incidents, the lamas reached the area of Tsurphu Monastery, not far from Lhasa in central Tibet. The Rinpoches spent a month at Tsurphu, which was still operating normally. But His Holiness the Sixteenth Gyalwa Karmapa, with his profound understanding and vision, was completely aware of the impending danger. 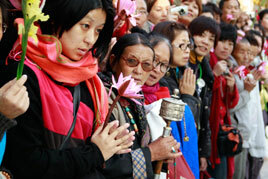 He told the group they must leave Tsurphu and continue toward Sikkim and India. 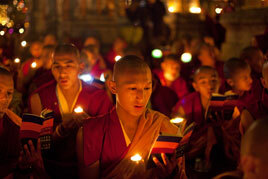 On March 7, 1959, His Holiness gave the lamas five yaks and supplies and three days later, they left Tsurphu. In fifteen days, they reached the border between Tibet and Bhutan. The Bhutanese would not grant immediate passage through their country, so the lamas were forced to spend one month at the blockaded border, when more than a thousand Tibetans died of starvation. 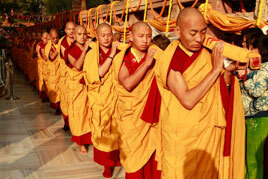 Finally, His Holiness the Dalai Lama secured the permission of the Indian government for the refugees to enter India. 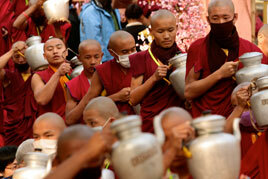 They were given rations, and the Bhutanese opened two roads through Bhutan. The Rinpoches traveled through to Buxador, a town at the border of India and Bhutan. Former prison quarters served as their housing, and food was provided by the Indian government. 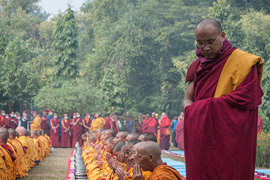 Eventually, more than 1,500 monks gathered at Buxador with a common vision of maintaining and preserving the dharma, organizing a Tibetan community, and teaching. 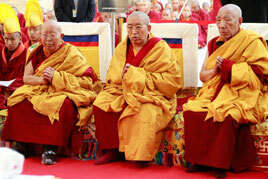 Khenpo Karthar Rinpoche remained there for eight years. 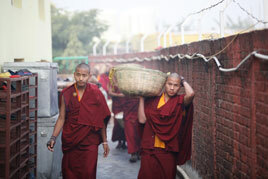 During his stay, Tibetan settlements were established in several areas of India, and many monks resettled in the new communities. Rationing was slowly discontinued. 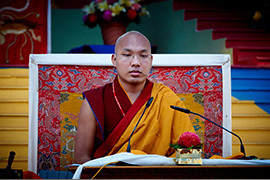 In 1967, Rinpoche was sent to Rumtek Monastery in Sikkim, the seat-in-exile of His Holiness the Karmapa, where Rinpoche taught the monks and performed various rites for local Buddhist families. Less than two years later, Rinpoche was sent to Tashi Choling Monastery in central Bhutan. Originally a royal palace of a previous king of Bhutan, the building was offered to His Holiness the Gyalwa Karmapa for use as a monastery by the Royal Queen Grandmother. Rinpoche stayed at Tashi Choling for six months, giving teachings as visiting khenpo, and teaching the nuns. 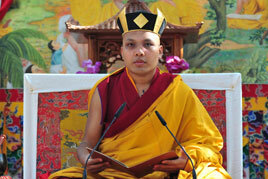 From Tashi Choling, Rinpoche went to Tilokpur, a nunnery in Himachal Pradesh, founded by His Holiness the Karmapa. Rinpoche stayed at Tilokpur for a year and then traveled to Tashi Jong, the site of Khamtrul Rinpoche's monastery in Himachal Pradesh. 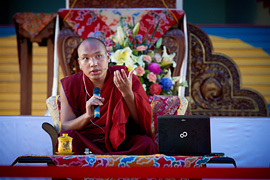 While at Tashi Jong, Rinpoche and eight hundred others received the Dam-ngag-dzod empowerment, transmission, and teachings from Dilgo Khyentse Rinpoche. 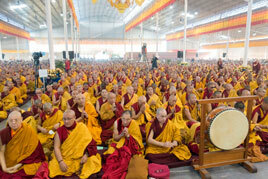 The Dam-ngag-dzod is one of the five collections of Vajrayana teachings by the first Jamgon Kongtrul Rinpoche. After four months at Tashi Jong, Rinpoche returned to Rumtek where he remained until 1975, when he was sent to another monastery named Tashi Choling at Therabtse in Tashigang, East Bhutan. It was in 1975 that Khenpo Karthar Rinpoche officially received the title of "choje lama" (superior dharma master) from His Holiness the Sixteenth Gyalwa Karmapa. Rinpoche stayed at Tashi Choling only one year before he was called back to Rumtek by His Holiness and asked to serve as the abbot of a new Karma Kagyu monastery that had yet to be built in the United States. 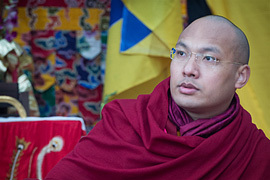 The following spring, Rinpoche was on an airplane bound for New York City to begin a different life as a teacher of the dharma in a culture and environment far removed from his home in Kham. Khenpo Karthar Rinpoche's biography continues in Part II with his life in America, his work as a teacher and author, and his return to Tibet.